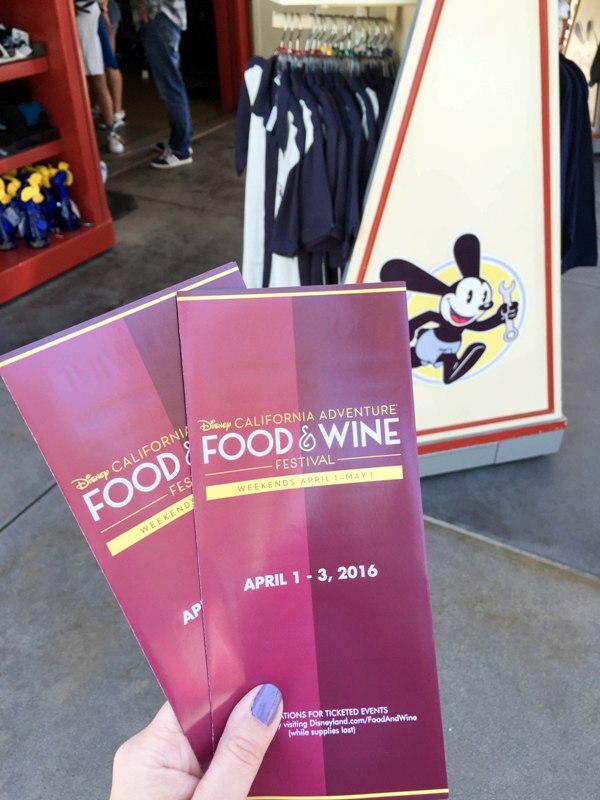 April 2016 marks the return of the Disney California Adventure Food and Wine Festival. 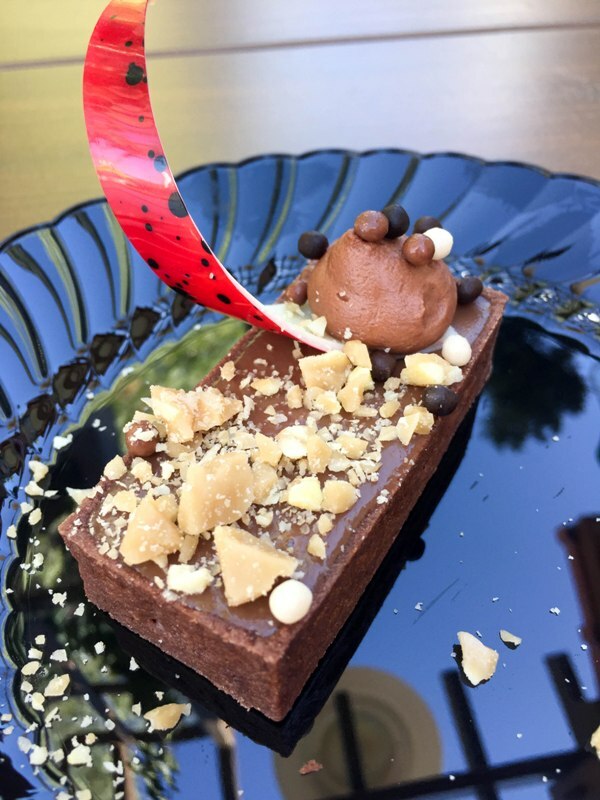 After a six year hiatus, the festival has finally returned to The Disneyland Resort and Disney foodies all across Southern California are rejoicing. 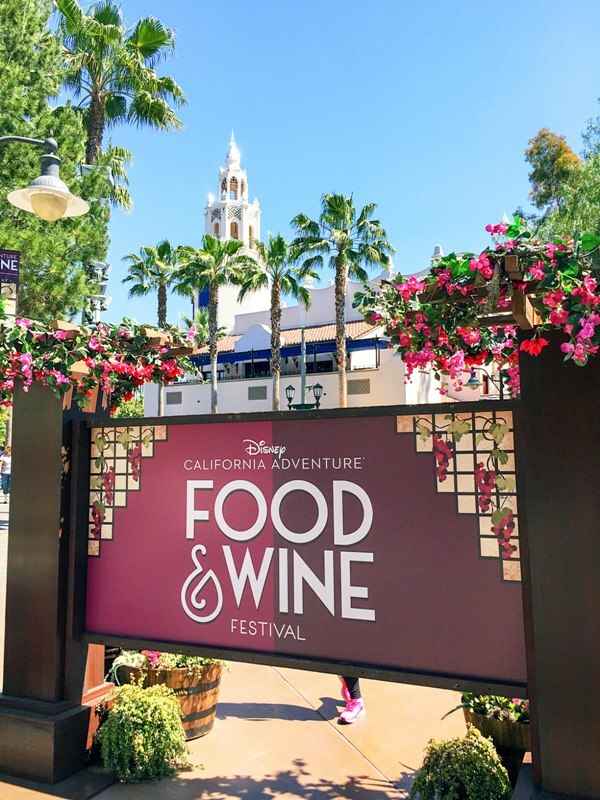 The Disney California Food and Wine Festival is open on weekends in April, Friday through Sunday, and is a food and beer lovers dream (a white wine lovers dream not so much, but I’ll get to that later.) But even with the serious lack of white wine options, the festival is a welcome addition to springtime at Disneyland. Last year when I went to Walt Disney World it was during the Epcot Flower and Garden Festival. They had several kiosks set up where you could sample unique foods and drinks themed to the different countries. 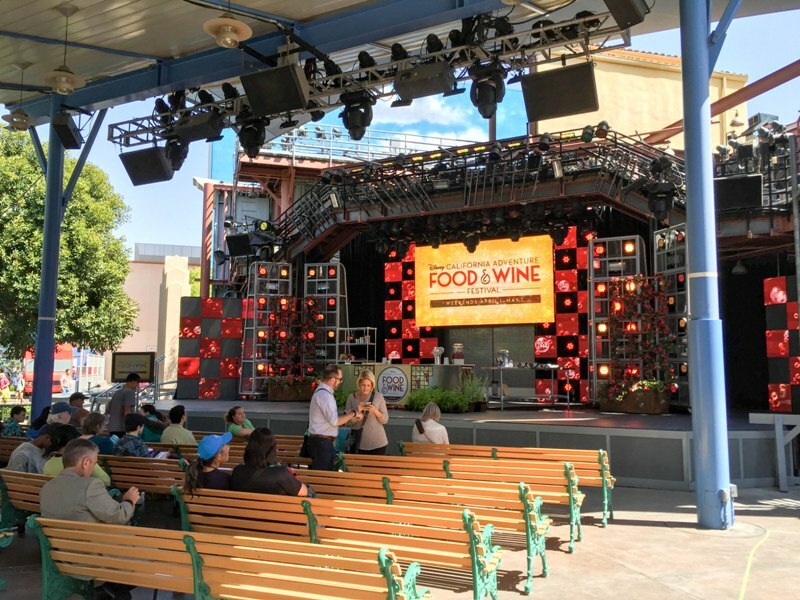 It was a lot of fun and it really made me miss the food and wine festival that used to be held at Disney California Adventure many years ago. 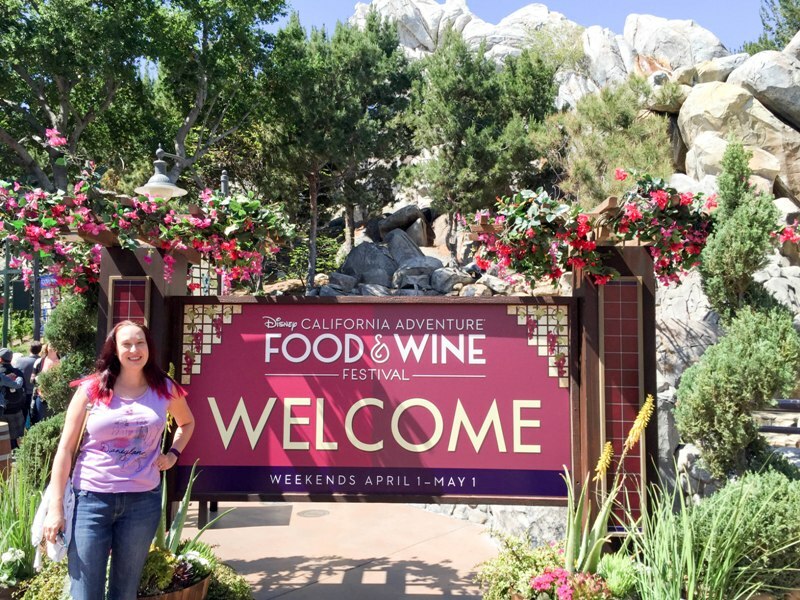 So earlier this year when they announced the return of the Food and Wine Festival at The Disneyland Resort, I was thrilled. To be honest, six years ago I was not as much as a food and wine “connoisseur” as I am now, so I didn’t really appreciate the Festival back then. In the last couple of years, I’ve really come to love wine tasting and pairing wines with foods. So combining that with my favorite place on the planet? Take all my money, Disney!! When you approach the front gate of Disney California Adventure, there’s nothing to indicate a special event is going on. 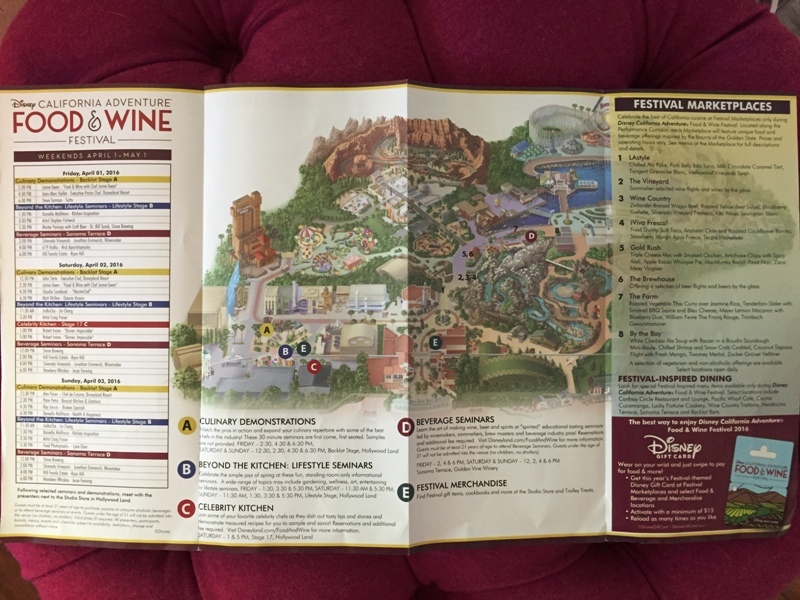 However, be sure to pick up the Food and Wine Festival map after scanning your ticket. 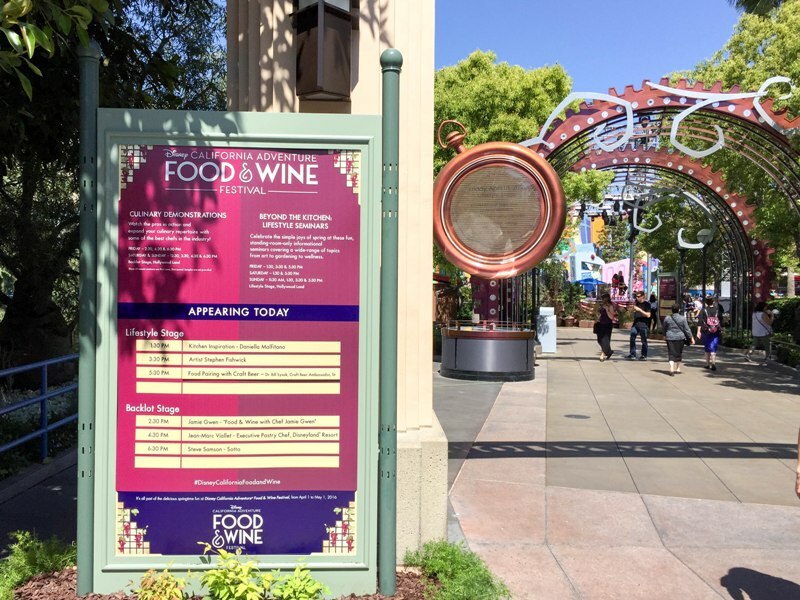 The food and wine kiosks are located along the Performance Corridor (aka the parade route) in between the hub and the entrance to the Paradise Pier area. 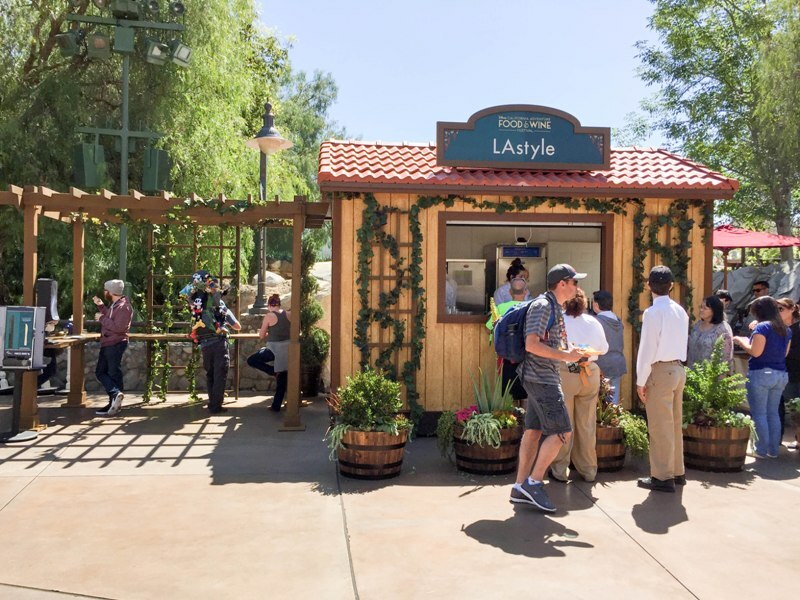 There are eight kiosks total (officially called Marketplaces but for the sake of confusion I’ll refer to them as kiosks for this article), with 3 or 4 food items and 2 or 3 drink options at each. These kiosks include The Vineyard, where you can choose from three different wine flights or 11 wines by the glass, and The Brewhouse where you can get two different beer flights or 8 beers by the glass. Adjacent to each kiosk are semi-covered wooden pergolas with counters where you can stand and eat your food. Utensils and napkins are available from self service dispensers. The demonstrations and seminars are located in the Hollywood Backlot area of Disney California Adventure. If you’re familiar with the Mad T Party area, that is where you will go to find stages set up for the presentations. 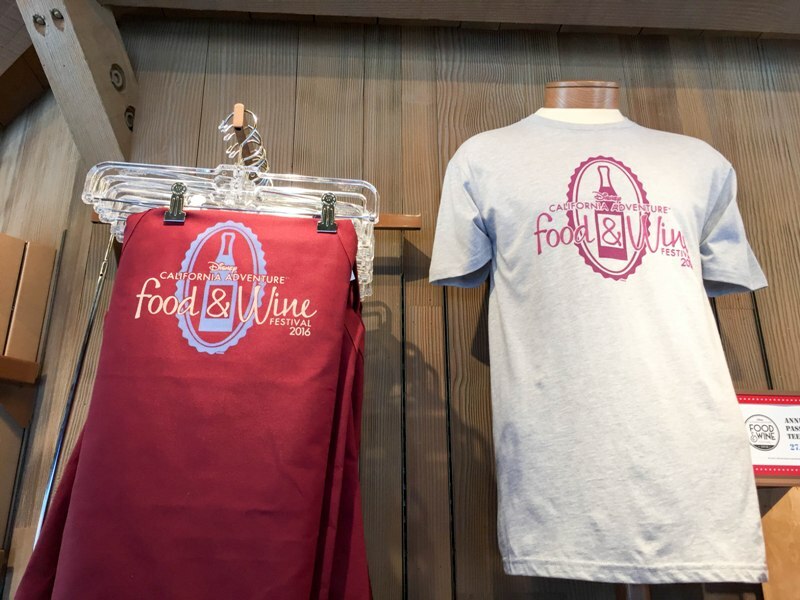 You will also find a merchandise kiosk where you can buy Food and Wine Festival branded items such as T-shirts, kitchen towels, and wine glasses. One of the most genius items they are selling is a food tray that has a space to hold your wine glass. This would have been handy as I was trying to carry 3 food items plus a glass of wine away from some kiosks. 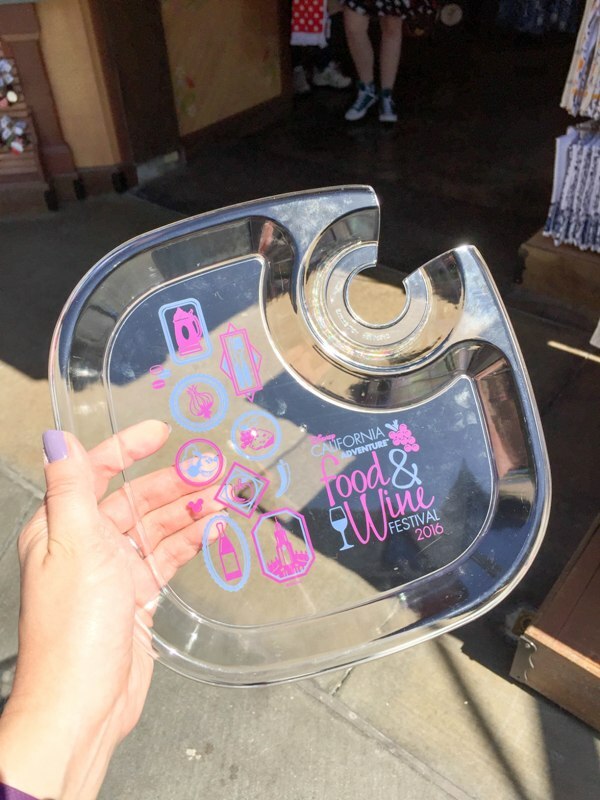 If Disney is smart, they will start selling these trays at every kiosk; they would make a killing on them. 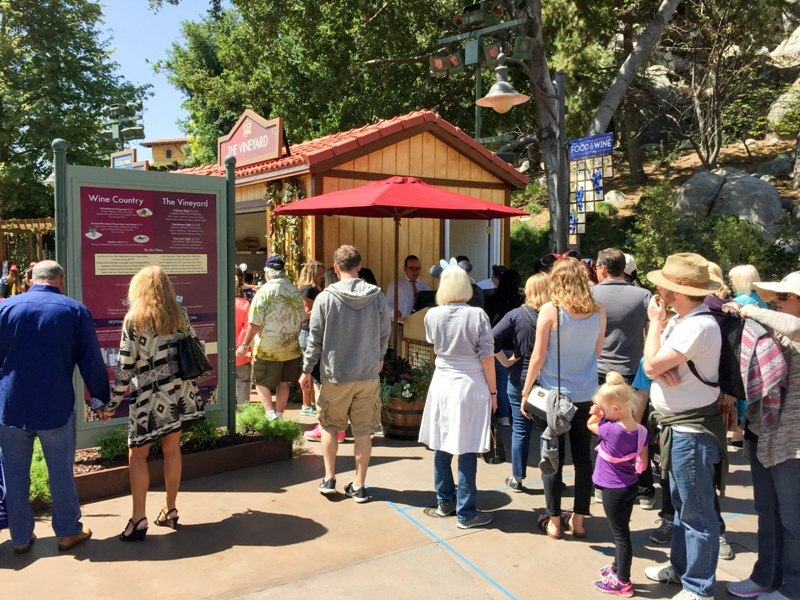 Instructor led tastings are located at the Sonoma Terrace, which is adjacent to Wine Country Trattoria. 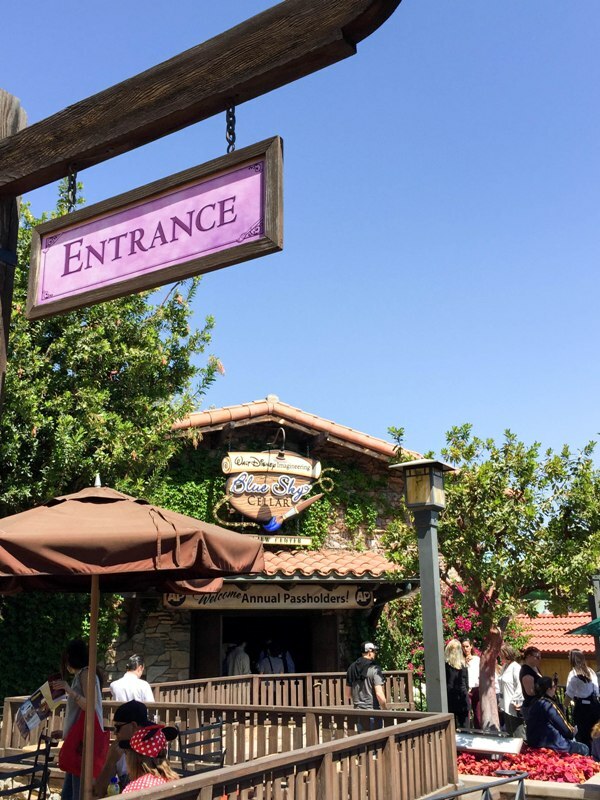 The entrance to the Sonoma Terrace is a little hidden; you’ll find it near the gateway to Paradise Pier by the “By the Bay” food kiosk. For Annual Passholders, there is a special area just for you. 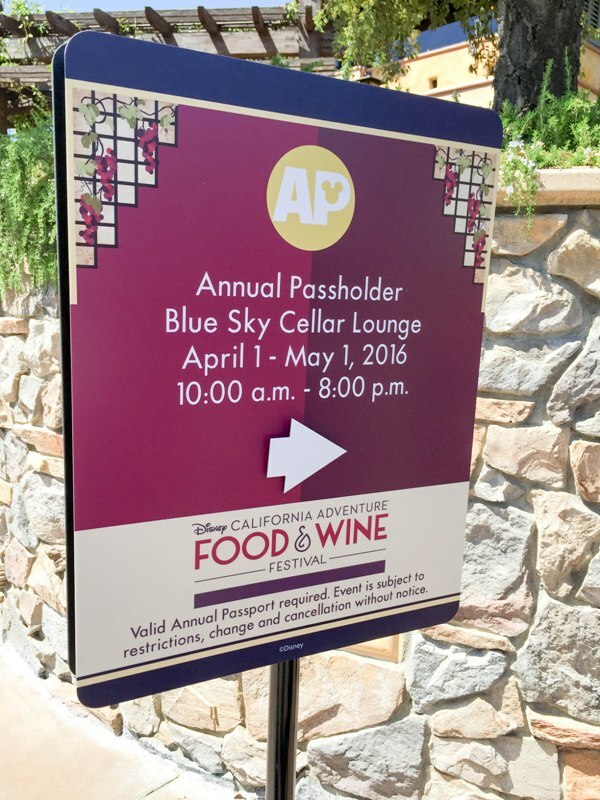 Located at the Blue Sky Cellar next to Wine County Trattoria is a private space just for AP holders. Inside the Blue Sky Cellar, you can watch the Journey of the Vine video that used to play on a loop inside the cellar when the park first opened. There are also outlets set up where you can charge your mobile devices (note that you need to bring your own cord – both plugs and USB ports are available). The Blue Sky Cellar offers a nice air conditioned, quiet place where you can rest. You can even bring your wine inside. Seating is limited but there are wine barrel tables set up. 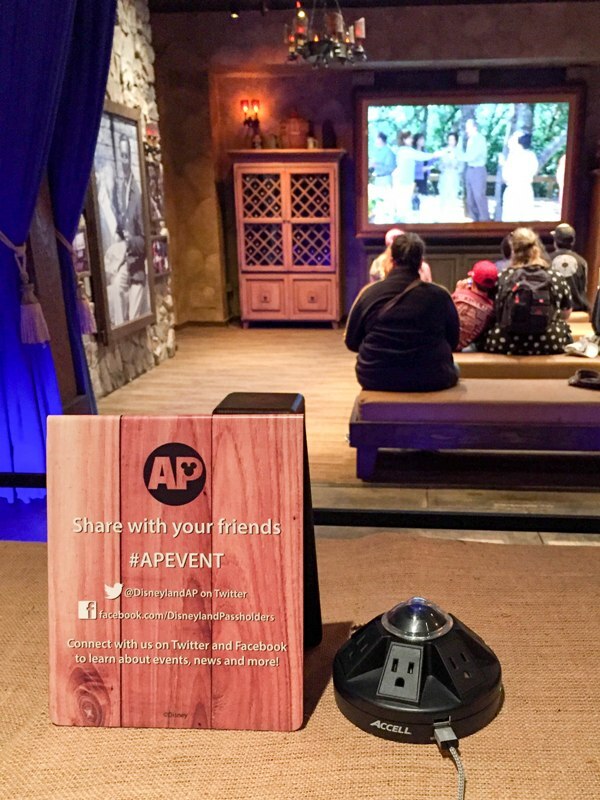 AP holders can also get a commemorative pin. They do scan your AP, so you only get one pin per AP. Also available to AP holders is a special lanyard with six tabs. Each tab can be redeemed for one food item at any of the kiosks. The lanyard is $45 for six tabs, making each tab worth $7.50. Most food items were between $4 and $8, so I’m not quite sure how this is a good deal. I suppose collectors will be interested in the lanyard itself, but strictly from a dollar value standpoint it doesn’t make much sense to buy the lanyard. 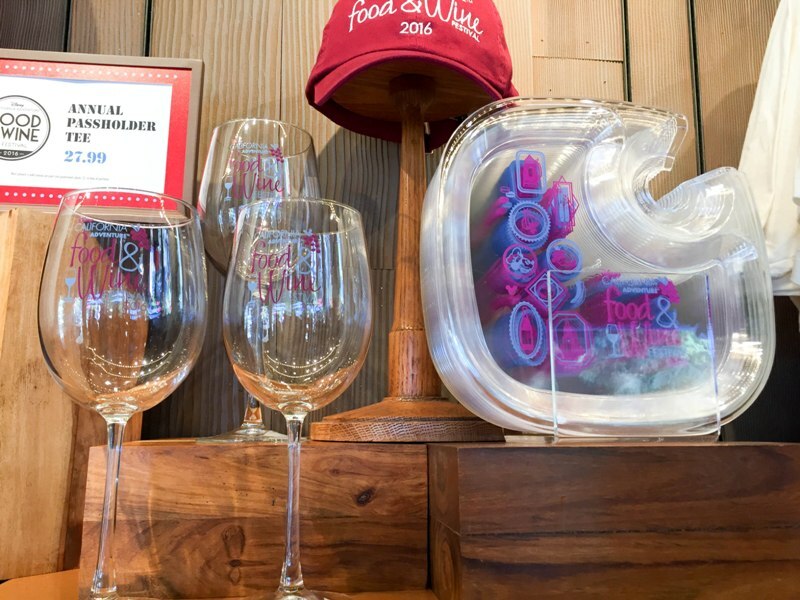 You can also purchase a special Food and Wine Festival branded Disney gift card. A minimum of $15 is required for activation. This was a little confusing as the signage made it seem like you needed this special gift card to purchase food and drink items, but this is not true. It’s simply meant to make it easier to pay as you go from kiosk to kiosk. Each kiosk also takes regular credit cards or cash. 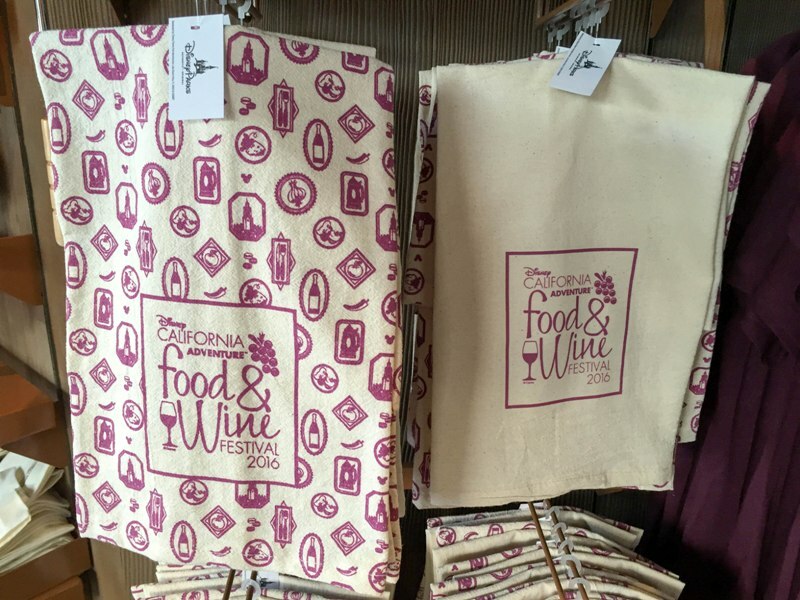 Note that AP discounts are not being offered at the Food and Wine Festival kiosks. 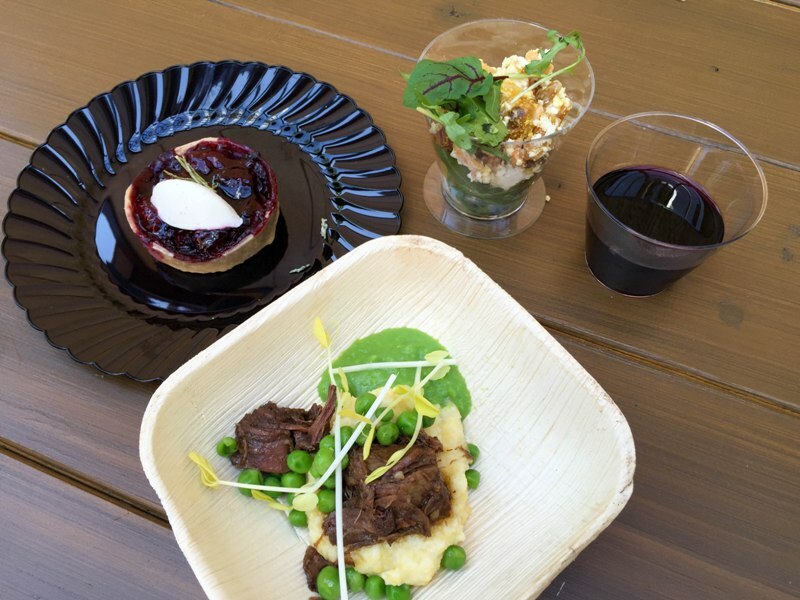 Like I stated before, I was very excited for the Food and Wine Festival to be returning to DCA. I went on April 1, the first day of the festival. I don’t think I was the only one excited because the crowds were intense. During peak lunch hours, some of the lines grew really long, so be prepared to stand in the hot sun for 20 minutes or more. I realize I was there on day one, but I don’t think Disney was prepared for the popularity of the Festival. Many food items could not be prepared quick enough for the demand. Utensils and napkins seem to constantly be running out and Cast Members scrambled to refill them. I had to ask a Cast Member for a fork on more than one occasion. I was also a little disappointed at the lack of knowledge shown by the Cast Members who are working the registers. Twice I asked two different Cast Members about the type of wines that were being offered at their kiosk, and neither of them could tell me anything about the wines, even something as basic as if it was a red or white. At The Vineyard kiosk, I overheard someone asking about the $25/glass Pinot Noir and the Cast Member had no idea it was even on the menu. I hope some of these issues will get cleared up as the festival continues. 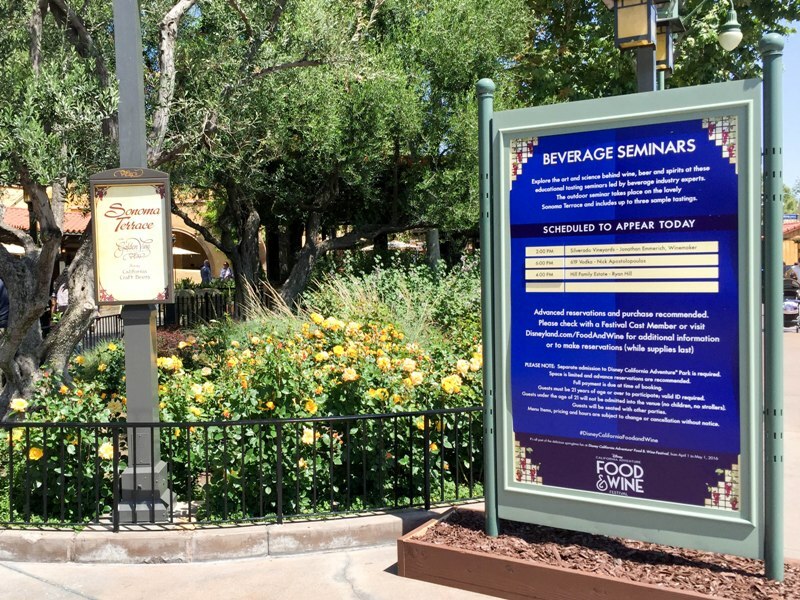 I don’t expect every Cast Member to be a trained sommelier but perhaps a reference sheet at each kiosk would be helpful. Okay, finally …. onto the food! I tried a number of items and I was pretty happy with everything I tried. There were a couple items I didn’t try and those included items made with corn or seafood. But here’s what I did try and the corresponding Marketplace. LAstyle – I had the Milk Chocolate Caramel Tart and it was delicious. Can’t really go wrong with chocolate and caramel. 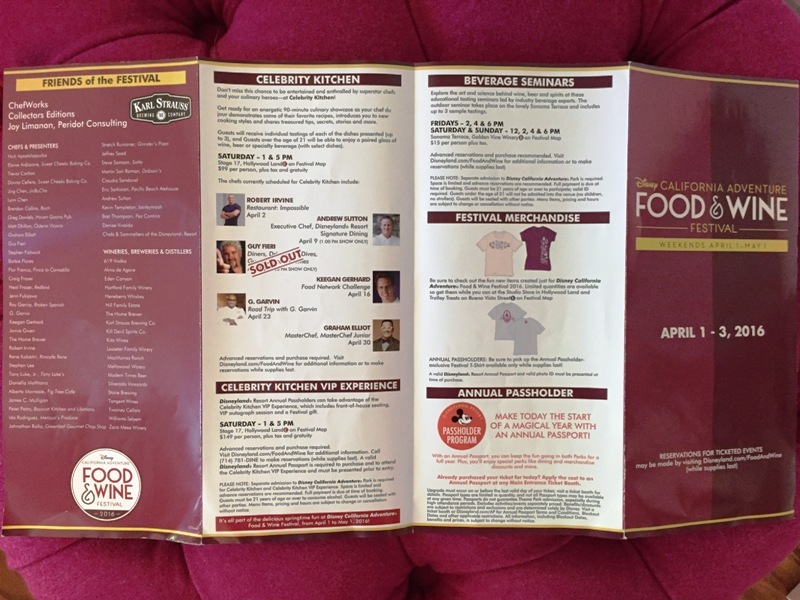 Wine Country – I tried the Wagyu Beef and Blackberry Tart. I also ordered the Beet Salad but I guess the CM didn’t hear because it wasn’t rung up. However, my friend let me have a bite of her Beet Salad and it was delicious. It was my favorite non-dessert food item. The Wagyu Beef was very good; it was served with polenta (which I didn’t eat) and spring pea puree. The beef was a little chewy but paired well with the cold pea puree. The Blackberry Tart was served with a rosemary vanilla bean creme fraiche which was delicious, but otherwise the tart was just okay. It was extremely messy and I managed to fling some of the filling onto my shirt while trying to break off a piece with my fork. So, thumbs down for stains. If you get the tart, learn from my mistakes and just bite into it. I also tried the red wine blend from South Africa and I thought it was really robust. I discovered I’m a fan of South African wines after I did the wine tasting at Animal Kingdom Lodge last year. Viva Fresca! 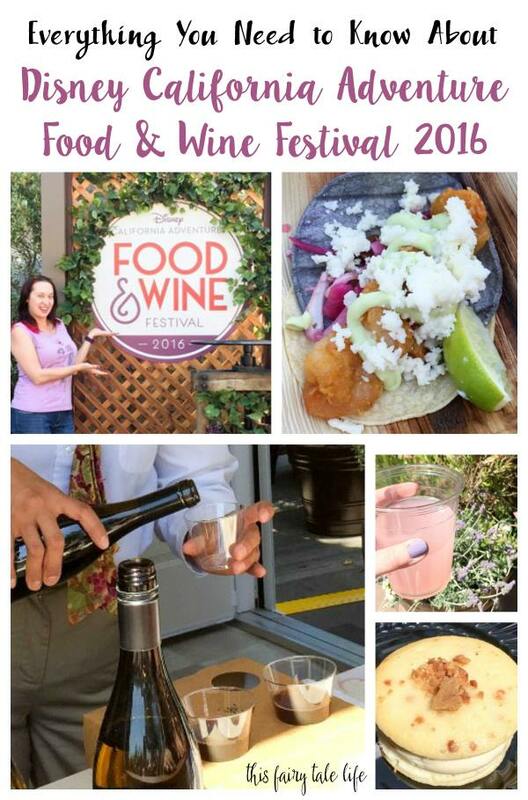 – My friend tried the Fried Shrimp Soft Taco (pictured at the top of the post in the collage) and said it was good, albeit a bit drippy/messy. I wanted to try the Chile and Cauliflower Burrito but it was unavailable – hopefully I can try it next time I go. 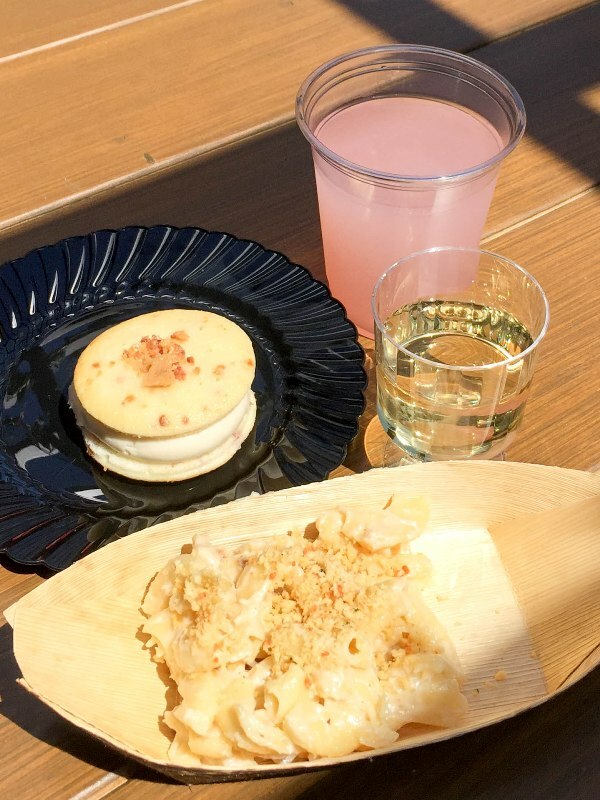 Gold Rush – I had the Triple Cheese Mac with Smoked Chicken, Apple Bacon Whoopie Pie, and Flower Field Lemonade. We had a bit of a panic moment when we overheard people in front of us being told the Triple Cheese Mac was unavailable (this was after 30 minutes in the queue), but a new batch became available right before we got to the register. However, the Artichoke Chips were then unavailable which was a bummer. As we were off to the side eating we noticed they became available but didn’t want to wait in the long queue again. Anyway, the Cheese Mac was very good – not spectacular like I was hoping. It was a little on the bland side, but I liked that it wasn’t overly greasy like some Cheese Mac can be. The Apple Bacon Whoopie Pie was my favorite food item of the day. It had a hint of maple flavor that made it taste just like a pancake with syrup. There was a bit of apple pie -like filling in the center. Completely delicious. I’ll have dreams about it for the rest of my life, I’m sure. The Flower Field Lemonade was flavored with lavender, and while it was very good it was VERY sweet. Too sweet for me to finish, which was a shame because I hate tossing perfectly good food. This would have been better in a smaller tasting glass, like the ones the wines are served in. I also tried the Viognier here and it was very good. 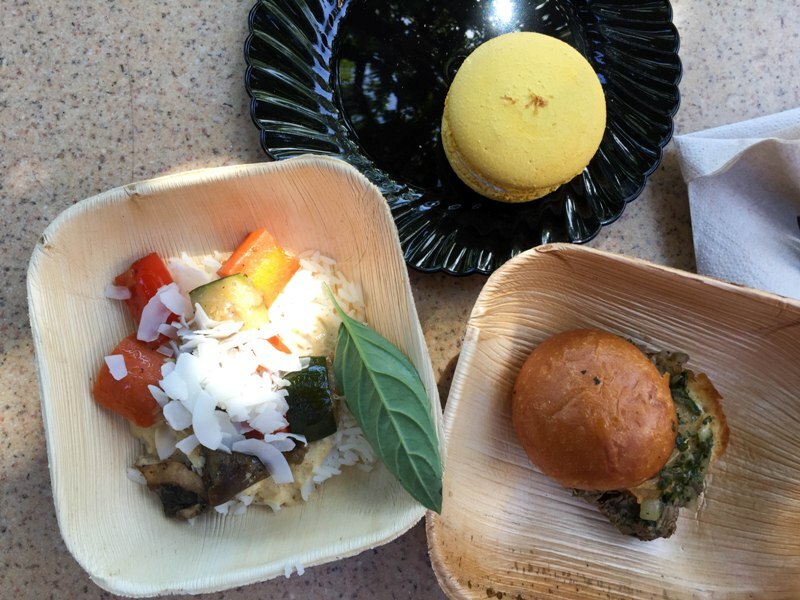 The Farm – I tried the roasted Vegetable Thai Curry, Tenderloin Slider, and Meyer Lemon Macaron. All three were great. The curry does have a spicy kick to it that was a bit too much for me but was otherwise delicious. The Tenderloin Slider was served with BBQ sauce and bleu cheese and my only complaint was that the bun overpowered the taste of the fillings just a bit. The Macaron was fluffy and tart, with a blueberry center. Very, very good. I didn’t partake in any of the flights but here is the info about them. The Vineyard offers three different wine flights – a Chardonnay flight, a Pinot Noir flight, and a Cabernet flight. Unfortunately these are the only three wine flights available outside of the guided tastings. So if you like white wine, like me, and you don’t like Chardonnay, like me, you are kind of out of luck. 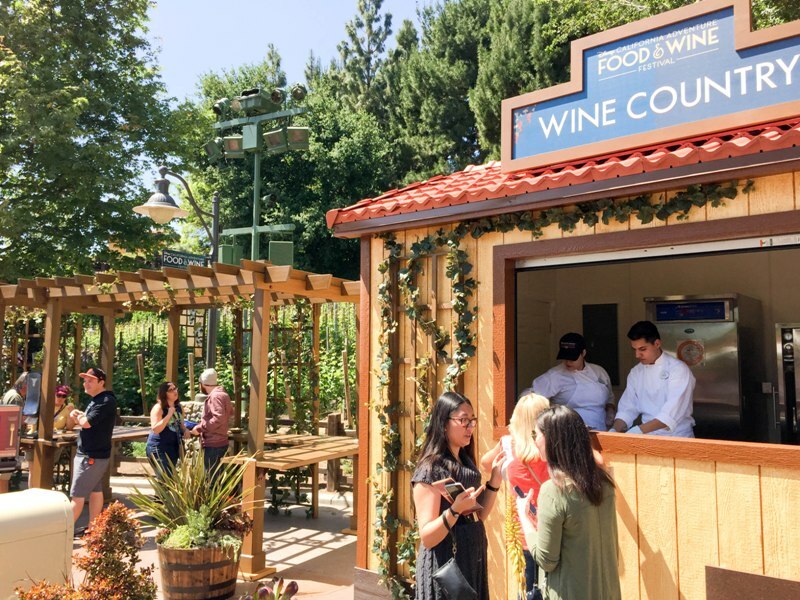 This is really disappointing, as one of my favorite things to do at DCA is sit on the Alfresco Tasting Terrace and enjoy a nice white wine flight. Wines by the glass include the nine wines offered in the flights, plus a sparking wine (Fairy Tale Cuvee) and a Rose. So not much white wine options there, either. To say I was bummed out by the wine selections was an understatement. The Brewhouse offers two beer flights with four samples each – a Northern California flight and a Southern California flight. All eight beers are also available by the glass. 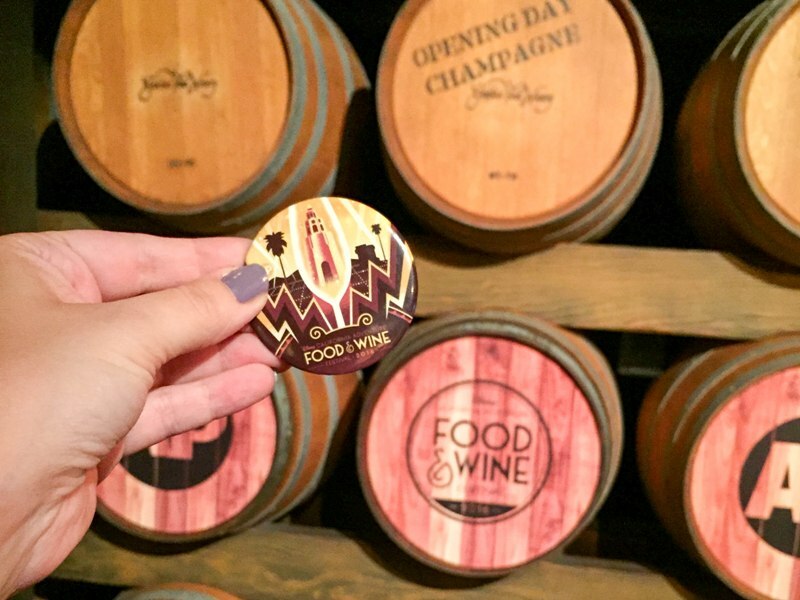 Overall I had a really great time at this year’s Disney California Adventure Food and Wine Festival and I’m so happy it’s back. There seem to be a few kinks to work out and I’m hoping future weekends go more smoothly. If you are heading to the Festival this month, I highly recommend you bring a hat and sunscreen, and drink plenty of water if you plan to be consuming a lot of alcohol. Between the queues and the lack of seating available, you are going to be on your feet a lot so wear comfortable shoes. And eat a light breakfast because you will leave DCA totally stuffed! 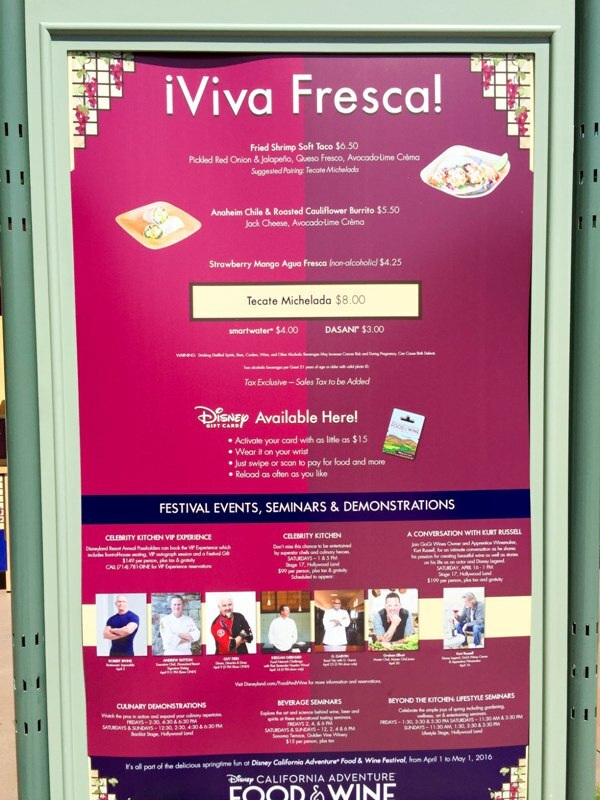 I’m glad they brought the festival back after such a long hiatus, but I miss when the tastings were free and the food demonstrations actually offered samples. I also wish that there was a better eating area since the standing area for eating was crowded and it was annoying to have to walk to an entire separate area of the park to find a place to sit down and eat. The offerings and price points were solid and I hope that they do have better selections of white wine flights for next year.